See it in action and contact us for a Free Trial! 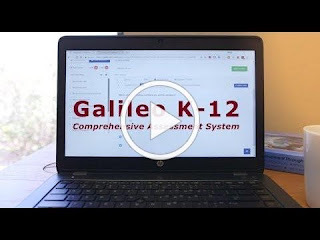 Galileo’s innovative Assessment Planner, Test Builder, and Item Builder tools make it possible for teachers and administrators to create and edit interim assessments, as well as build their own items aligned to meet the rigor of state standards. Today we are going to focus on the capabilities of the Galileo Test Builder features. Galileo Test Builder makes it easy for teachers and teaching teams to create multiple types of assessments. Test Builder is an intuitive, point-and-click interface for creating common formative assessments at the school and class level and in multiple subject areas using items including technology enhanced items. Designed to be optimized for desktops, laptops, and tablets, teachers can create an assessment by simply selecting the standards of interest in ELA, math, or/and science, automatically search the item banks, and pick the questions that best fit their needs. There are over 80,000 items in the ATI Community Item Bank to select from and districts have the additional option to access the Inspect® and Navigate™ item banks. Additionally, the Galileo Test Builder interface includes state-of-the-art Item Builder tools. This makes it possible to create items and to align these items to state standards in any grade and subject. Assessment items may be accompanied by images, text, and links to a variety of media (e.g., videos, images, texts, attached files) and associated with metadata (e.g. DOK). Test Builder includes a search item function that makes building formative assessments easy. Galileo offers flexible test administration with the ability to publish the newly created formative assessment either online and/or offline. Users can quickly copy and edit assessments and items. Users can also place assessment and item content into shared libraries. And don’t forget, the Text Editor, Math Editor, and Chemistry Editor tools simplify building new items involving equations. Galileo’s technology supports educators desiring to create items and/or assessments for multiple different measurement purposes. Watch for the new Galileo Tour video which digs deeper into the features and functions of Test Builder. For further information on how to create Galileo formative (classroom and school-wide) assessments, contact your Field Services Coordinator or access the Help Files via the Galileo application. ATI understands the importance of administering the right assessment at the right time. In that regard, our Educational Management Services (EMS) team works closely with educators to design and deliver customized benchmark assessments that are reliable and valid and aligned to local and state standards. Step 1: Contact the ATI EMS team prior to, or at the start of the year, to begin the assessment planning process. This is when roles and responsibilities are identified with district staff regarding the planning, construction, and review process. Step 2: Define the assessment goals using the Galileo Assessment Planner. The planner also supports requests for TE items. Step 3: Our EMS team reviews the Assessment Planner to confirm all the information needed to get started is provided. Step 4: Our EMS team develops the Benchmark draft. During this step, Galileo technology ensures that items are not repeated across assessments throughout the year and balances the number of questions per text. Also, Item Response Theory makes It possible to determine the reliability and difficulty of each assessment in advance. Step 5: EMS conducts a guided review of the benchmark draft with your district staff. This gives you the opportunity to request changes in the draft, such as replacing an item type. Step 6: After we’ve made the finishing touches, ATI delivers the final benchmark assessment to your district. 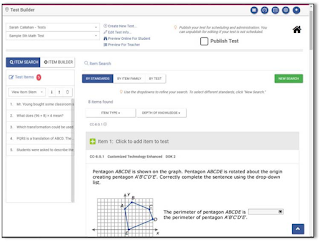 In creating customized assessments, ATI has developed a tool for educators within Galileo called the Assessment Planner. 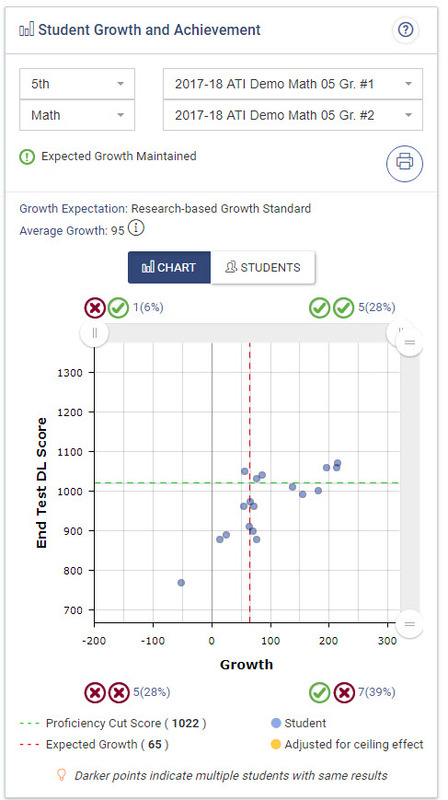 The Galileo Assessment Planner is an easy-to-use, point-and-click interface that lets educators participate in the design of customized benchmark assessments. 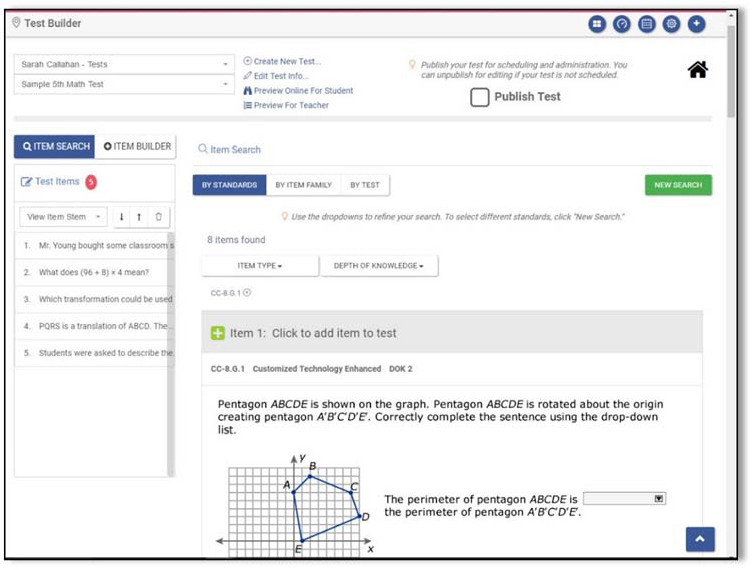 Using the Assessment Planner, educators can quickly create an assessment plan that spans multiple grades and subjects; determine the timing and number of assessments within a grade and subject; set the standards to be measured; choose the desired number of items for measuring each standard across each benchmark; and specify the type of items needed. Additionally, the Assessment Planner allows educators to provide comments to EMS regarding specific benchmark needs. This could range from a certain item type, like Technology Enhanced items, to certain concepts within a math standard, like addition or subtraction. During the planning process, EMS provides valuable recommendations for educators to follow. This includes the recommended length and content coverage in the planned assessments, the appropriate number of assessments to be administered throughout the year, and the best timeline for delivering each assessment. With EMS recommendations, educators can lay the foundation for a reliable and valid assessment¬¬ and smooth testing schedule. Our unique process in creating customized benchmark assessments maximizes collaboration with your district and helps EMS to build reliable and valid assessments aligned to your local and state standards. Of course, quality requires time so it is important that you allow for a two-week delivery window for pre-made assessments and a six-week window for assessments aligned to district curriculum. 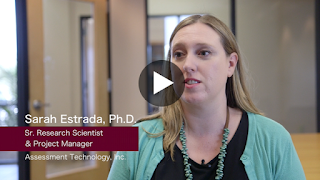 ATI’s customized benchmark assessments provide valuable data about student standards mastery, achievement, and growth throughout the year, all of which help educators to improve instructional effectiveness and student learning. Check out the Galileo Help Files for resources including this guide: Assessment Planner and Test, or Contact our EMS team today to learn more about our customized benchmark assessments. We have built Item Response Theory (IRT) analyses right into Galileo. As a result, we can provide rapid analyses for thousands of unique assessments including customized assessments, each year. The benefits to clients include customized assessments that, just like pre-built assessments, have the capability to measure achievement and growth, forecast state test performance, and provide categorical growth analyses of student ability based on district and specific student populations. No other system can do this. Contact a Field Services Coordinator to learn more about IRT research and set up a demo of Galileo today. District personnel export data from thier Student Information System (SIS) including students, classes, teachers, and enrollment records. This file is formatted according to the GDI instructions and uploaded to ATI. ATI staff import your data into a QA Galileo environment and perform a thorough quality assurance review. Any detected problems are resolved with the district before the data is imported into the production version of Galileo (step 3). Once the file passes QA, ATI staff import it into to the production Galileo environment. Districts should use the Upload Planner to manage their data uploads, especially before and during the beginning of the school year. On the Upload Planner, you can enter the number of expected student, teacher, and class records in the file (estimates are fine). This helps the quality assurance process. The Upload Planner can also be used to communicate with ATI and receive GDI status updates. You can enter the email addresses you want automatically notified on the upload planner when the upload status changes or comments are entered. You can also contact ATI Technical Support for assistance using the Upload Planner. Files can be submitted two ways: 1) Using the Upload Planner – a manual process. 2) Upload to secure FTP, which can be automated. For reasons of security (the protection of district data), ATI does not accept GDI files sent via email. Detailed instructions for GDI can be found on the Tech Support page once logged into Galileo K-12 or Galileo Pre-K. Importation instructions are kept updated for ease-of-use. Please review the GDI Instructions prior to your first upload of each school year. The K-12 GDI instructions are available here: http://www.ati-online.com/pdfs/ImportInstructionsK-12.pdf. Be sure to include values for all required fields in the file you upload. Refer to the GDI instructions for required fields and data length requirements for each field. Failure to include values for required fields may result in a file being returned to district personnel for correction. For example, excluding teacher email prevents staff users from utilizing the “Forgot password” feature the first time they sign-in to Galileo. Users that don’t have an email will be prompted to enter one after their first successful login. Providing standard district email addresses in the GDI file is recommended. It’s also strongly recommended that K-12 districts use email addresses for teacher usernames to ensure uniqueness. If students have district assigned email addresses, we also recommend using email for student usernames. This is the best way to ensure a district gets all the usernames specified in their GDI file. Using a generic format such as first initial and last name will result in many usernames being modified by GDI for uniqueness. For example, if “jjones” is specified for a teacher username, GDI will likely have to append characters to ensure uniqueness (e.g. “jjones3”). Last, failure to include certain optional fields may adversely affect future report filtering or other Galileo functionality. Important: If ID fields such as StudentID, TeacherID, CourseCode, SectionID/ClassID change within your SIS, or you migrate to a new SIS, it’s strongly recommend you contact ATI GDI staff as soon as possible to ensure proper migration to the new IDs. Large-scale ID changes typically require extra processing time so please notify ATI as far in advance as possible, so we can help you plan accordingly and prevent problems that can occur from changing IDs (such as mass duplication of student, teacher, or class records). This also allows time for quality assurance to detect any problems, and for district personnel to correct and resubmit a file if needed. The QA process is typically longest during your first upload of the year. Getting uploads underway as soon as data is available will help ensure adequate processing time before teachers and students start using Galileo. Uploading data as soon as it’s available in your SIS is recommended, even if enrollment records are not complete (i.e. for the first day of school). Sending an initial file will allow QA to proceed so any issues can be identified and remedied well before students and teachers start using Galileo. Enrollment can simply be updated with subsequent GDI uploads. If you use the Instructional Effectiveness (IE) Galileo K-12 module, you should upload data for all responsible teachers. Participation in No-Evaluation Importation (NEI), the process of preparing for frequent uploads (as often as nightly), requires three successive no-change imports at the beginning of each school year. If you have any questions about GDI, please refer to the GDI instructions at http://www.ati-online.com/pdfs/ImportInstructionsK-12.pdf or email us at GalileoDataimport@ati-online.com.